Here's an interesting paradox. I have a hollow object which has infinite height. I can fill the object with paint, but if I try to cover the surface with that paint, there won't be enough. According to some, the archangel Gabriel (shared by Judaism, Islam and Christianity) is expected to blow a horn to indicate the last days are upon us. The mathematical paint paradox involves the volume and surface area of a 3D object resembling Gabriel's horn in this picture. 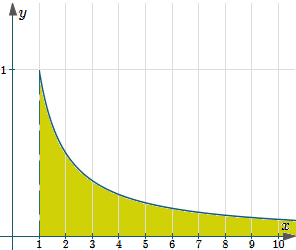 We choose the right-hand portion (to avoid the discontinuity at x = 0) and plot the graph starting at x = 1. 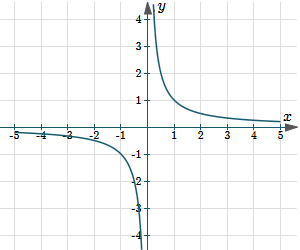 We consider the (infinite) shaded area to the right of the dashed line, below the curve and above the x-axis. 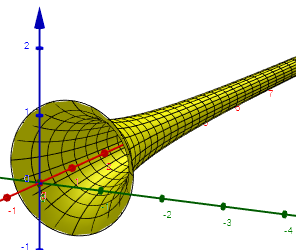 We rotate that area in 3 dimensions around the x-axis and end up with an (infinitely long) horn-like object. As b gets larger and larger, the final fraction in our answer gets smaller and smaller, so the volume is a finite quantity, π. Next, let's consider the surface area of the horn. as x gets very large, we can see it will get very close to 1/x (but will be just a little bit bigger than it). Now as b gets larger and larger, this quantity also gets larger. That is, it is an infinitely large quantity. 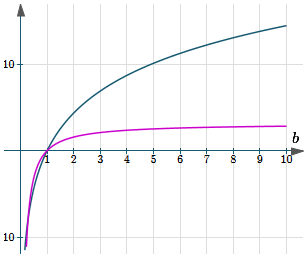 Here's the graph of our two solutions (in the variable b) - the magenta (pink) one is the volume V = π (1 − 1/b), while the green one is the surface area, S.A. = 2π ln(b). We can see the volume is tending to a limit (π), while the surface area just keeps on getting bigger. So if we try to paint the outer surface with our π liters of paint, it will quickly run out. So how can it be that we have a finite volume, but an infinite surface area? 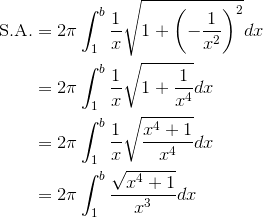 The paradox about an object having finite volume but infinite surface area caused a lot of dispute regarding the nature of infinity among mathematicians of the 17th century, including Galileo and Wallis. Such paradoxes are a great way to get us thinking! See the 6 Comments below. A very nice problem with a great answer. 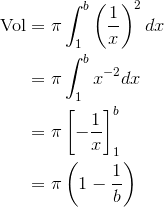 Actually the volume we get after integrating is tending to that volume as length is infinitesimally large. So it will hardly make any difference in volume whereas it's surface area will keep on increasing. @Christian: Thanks for pointing out the error, which I have fixed in the post. I didn't question myself as the end result was the same, as you said! So what would happen if someone were to hold the Horn vertically and fill it up with π litres of paint? Would the inside surface of the Horn get covered in paint entirely? @Jan: Excellent question! Counter-intuitive it may be, but I suspect not. Anyone else like to weigh in?